Many who know me also know that I’m a huge fan of Evernote. I will, in fact, admit to being an unashamed Evernote evangelist and am happy to demonstrate all the ways that I use it if anyone so much as hints at wanting to know. I type meeting notes directly into Evernote, document work-related tasks and collect all manner of bits from the web, including articles, blog posts, and reviews. I create to-do lists and shopping lists for work and home. I use Evernote to brain-storm ideas and to write drafts. In the interest of eliminating paper, I’ll snap shots of meeting handouts using Evernote’s camera feature. Adding photos is also a handy feature when shopping. In less time than it takes for me to dig for paper and pen, I can grab my phone and take a picture of whatever it is that caught my eye. Did I mention that you can put Evernote on iPads, phones (Android and iOS), and computers, in addition to accessing your account from any web-enabled device? I digress. As fond as I am of the camera feature, however, it has it’s glitches. My iPhone wants to take very nice pictures. Very nice pictures translates into big files, and one of my few quibbles with Evernote (there, I said it) is that it doesn’t allow you to resize images within a note. 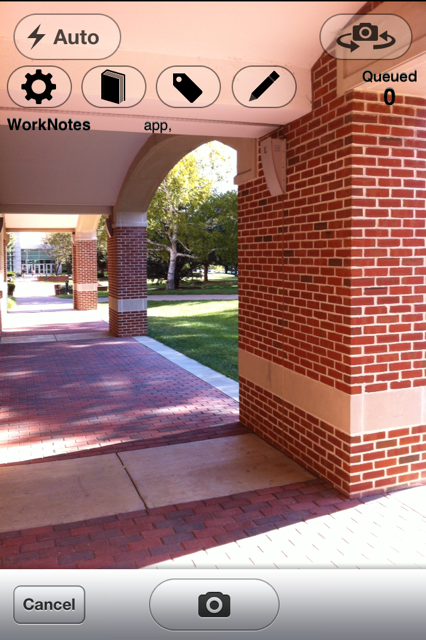 Adding multiple pictures within a note would sometimes cause Evernote to respond with less than stellar results. So I was very happy when I heard about FastEver Snap ($1.99) for the iPhone (and, before you ask, it will work on the iPad as well). The app is designed specifically for use with Evernote and provides Evernote’s missing ability to resize images. Onscreen icons give you the option to quickly choose which notebook you want your photo in and to assign the appropriate tags. I also like that there’s a setting where I can turn off having the photos I take with FastEver Snap automatically saved to the camera roll. Another Evernote-related tip I learned about recently was a quick way to search for unchecked check boxes. Up until now I had been periodically reviewing older lists looking for the tell-tale empty box that meant, at the very least, I’d simply forgotten to check something off, or worse, I’d missed a task on a to-do list or project list. Following up on my lists this way was inefficient at best. I was thrilled when I came across this tweet by Fraser Speirs. I had to try it immediately and, oh joy, it’s a simple thing to do and it works. Evernote tip: a saved search for “todo:false” produces every note with an un-checked checkbox. Powerful. Are you an Evernote user? Have an Android or iOS tip to share? Leave a comment and tell us about it. This entry was posted in Tips and tagged app, Web Tools by Anita. Bookmark the permalink. I am an Evernote addict and not afraid to admit it. Thank you, Anita, for introducing me to it!